Recently I stumbled upon a new new app for todos (I am not sure anymore, where I found it, but I guess it was from Belle Beth Cooper. She does some interesting blogposts on managing your life with tools and apps). 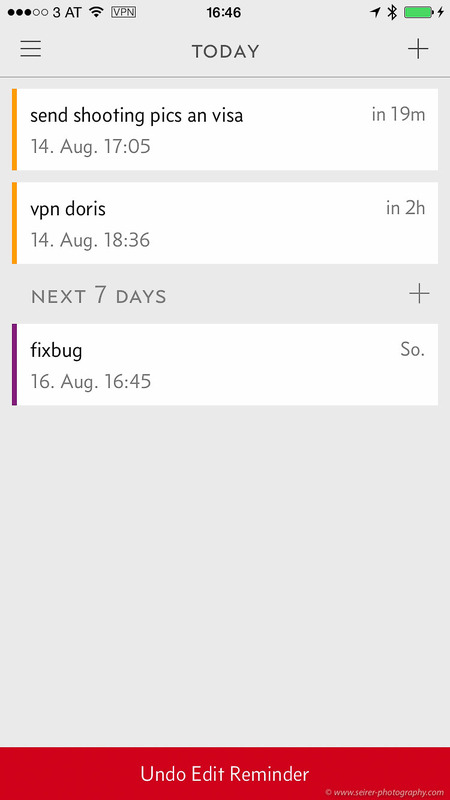 Due App - Oh nooo... another todo app? You can enter new todos pretty fast with a intuitive user interface that lets you specify the due time in a flexible way with very few taps. You can configure all kinds of settings, it reacts naturally on todos like "go running tomorrow 07:30", is timezone aware and many other features. With a reasonable price of around 5€ it does what it promises and I love using the app - in addition to my other todo apps (like Wunderlist). The creators found an interesting niche in this crowded app-space and delivered a very polished, usable and beautiful app. I strongly recommend to check it out. Posted on August 20, 2015 by Michael Seirer and filed under productivity and tagged Due iOS App todos.